The draft registration card for Charles Crummer (1894-1934). The card contains the demographic information for the soldier including name, age, home address, date of birth, place of birth, race, citizenship, trade or occupation, number of dependents, whether tall, medium, or short, slender, medium, or stout, eye and hair color, whether bald, and disabilities. World War I draft registration cards were completed by approximately 24 million men living in the U.S. in 1917 and 1918. Originally created by Tyre E. Davis and published by the War Department, Office of Provost Marshal General, Selective Service System. Davis, Tyre E. and War Department, Office of Provost Marshal General, Selective Service System. 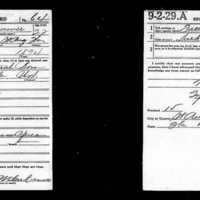 “Draft Registration Card, 1917.” RICHES of Central Florida accessed April 22, 2019, https://richesmi.cah.ucf.edu/omeka/items/show/10383.